Little kids will do more than play with their toys for an hour, they will carry them everywhere they go. They will ask to bring them on road trips, to hold them while they sleep and to sit beside them during family dinner. If you make your kid one of these handcrafted toys, they will definitely fall in love with their fuzzy friend. 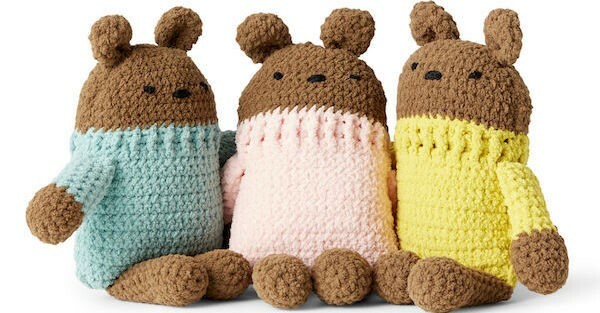 Any crafter that’s comfortable with a pair of steel crochet hooks should think about making some crochet square bears wearing adorable turtleneck sweaters for their kid. The Yarnspirations website has the delightful pattern available for absolutely no cost — the page will show you what accessories you need, what yarn types you should use and how to follow the pattern. The pattern is easy to learn and quick to finish, mostly using single crochet and front post and back post detail work. The recommended colors are Bernat yarn in brown bear and clear sky shades, but you can explore the latest Bernat yarn products for bold choices like sunflower, leap frog, dandelion skies or spring lamb. Socks always seem to go missing during the stages of washing, drying and folding laundry, which leaves half of a pair sitting in the basket. When you have collected enough separated sets, you can make a mismatched sock snake and upcycle all of that patterned fabric into a sweet toy for your little one. Start off by picking the fabric you want for the head of the sock snake and cutting off the area where the toes normally go — stitch the mouth closed and fit it with a long red ribbon that will later transform into a tongue. Continue to snip off the ends of the socks and stitch the pieces together so that it forms a long tube until you want to stop. Leave the tail end open so that you can push stuffing into the body and then sew the last seam shut. Use a hot glue gun to stick on eyes made of buttons or fabric circles and take scissors to fork the ribbon tongue. Encourage your kid to draw a picture of a stuffed animal that they want and then use your crafting abilities together to make that imaginary creature into a real toy. It could be a simple bunny or a unicorn with dragon wings because as long as the lines are easy to follow, you can bring that dream to life. In order to make a hand drawn stuffed animal craft for your kid, you will need scissors, thread, sewing needles, pins, stuffing, a sewing machine, different fabrics and a Xerox copy of the drawing to use as an outline. Your heart will absolutely melt when you watch your child carry their new toy around the house, invite it to tea parties and try to feed it their afternoon snack. The time and effort spent on making toys will be worth it, especially when you see sweet moments like these.